The dishes that most often come to mind when thinking about Tamil Nadu cuisine are dosa, filter coffee and chettinad chicken. However, there is a lot more to the cuisine, with regional variations and influences from other places. From vegetarian to meat dishes, the interesting array will leave travelers spoiled for choice. As the keepers of the temples, the Brahmins, who settled in Tamil Nadu, are vegetarians. The cuisines of the two Brahmin sects in Tamil Nadu – Iyers and Iyengars – vary slightly, as it does from one region to another due to local influences. However, choice of vegetables and the use of medicinal ingredients are common points. Earlier, onion and garlic were rarely used in cooking due to their pungent odor, but this practice has changed over the years. Similarly, the concept of breakfast didn’t exist in most Brahmin households until recently. 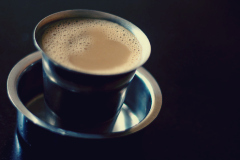 Several servings of filter coffee would be provided for sustenance until a full course mid-morning meal was served. Then, filter coffee and light snacks would be served at around 3pm, followed by another full course meal for dinner. Nowadays, with many Brahmins opting for office jobs, breakfast is eaten early. Dosa and Idli (steamed rice flour and lentil dumpling) are the most popular breakfast dishes. Usually, they are served with fresh coconut chutney and sambar (a lentil curry with vegetables), while a spicy ‘gun powder’ mixed with gingelly oil, adds punch to the dish. 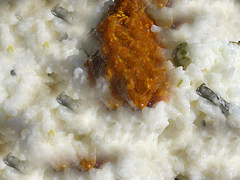 Other breakfast dishes include upama (made with semolina and vegetables) and pongal (a rice dish). Traditionally, lunches and dinners have at least three courses featuring rice served with curries or gravies. Rasam (a spicy clear soup flavored with pepper, cumin, turmeric and asafetida) usually makes up one course, and Thayir Sadam (rice with curd and seasoning) is always the last course. Kootu (stews or thick gravies with vegetables, coconut and lentils), poriyal (dry preparation of vegetables) and vadam (crispy sundried food such as pappad or salted vegetables) are also a part of every meal. The emphasis is on fresh cooked food and seasonal ingredients. The Chettinadu region gets its name from the Chettiars – a trading community. In the ancient times, their love for adventure carried them across the seas to Burma, and they brought back with them East Asian influences in the flavors of their cuisine. Unlike the Brahmins, the Chettiars eat meat and fish. Dishes have freshly ground spicy ingredients such as pepper corn, whole red chilies, fennel, cumin, cinnamon, clove, bay leaf and fenugreek. While the fame of Chicken Chettinadu – a spicy curry – has spread beyond the boundaries of the region and Tamil Nadu, the cuisine type is also well known for some exotic vegetarian dishes and rice based preparations. Rabbit, turkey, quail and mutton are the meats other than chicken, which are used in meat dishes. Famous dishes include Mutton Leg Soup, Mutton Varuval (dry fried mutton with spices), Thalakari Kuzhambu (Lamb head curry) and Kaadai Roast (quail roasted with spices). Seafood is also consumed and dishes such as sura puttu (shredded shark), Viral Meen Kuzhambu (Butterfish gravy with mango) and Vanjaram Fry (Seer fish fried with ground spices) feature in many Chettinad meals. The cuisine also has its share of vegetarian delicacies, the most famous of which is Kara Kuzhambu (spicy gravy with vegetables). There are some exotic seasonal dishes that are served in Chettinadu homes, including Vazhai Poo Murungai Keerai Thuvattal (dry vegetable side dish made from banana flower and drumstick leaves) and Pala Kottai Poriyal (dry fried jack fruit seeds). Rice dishes are served at every meal. The list includes Biryani, dosa, uthappam (thick rice pancake), idiappam (string hoppers) and adai (flat bread made from rice flour). 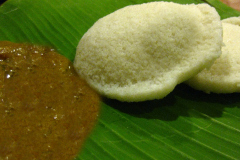 Sweet dishes that are unique to the region include sweet paniyaram (made from idli batter) and kozhakattai (steamed rice flour dumpling filled with grated coconut and jaggery). The Kongunadu region in western Tamil Nadu, which comprises the districts of Salem, Erode, Tirupur, Coimbatore and Palani, has many unusual vegetarian dishes – mostly rice based. The flavors are unique, with locally grown ingredients being used in dishes, including ginger, coconut, turmeric, sesame seeds and groundnuts. Among the popular Kongunadu dishes are arisi parippu sadam (rice with lentils and spices), pazha dosai (pancakes made with banana, rice flour and wheat flour), santhakai (rice vermicelli) and ragi iddiappam (steamed noodles/vermicelli made from millet). In addition, delicious sweet dishes such as ellaneer payasam (tender coconut pudding) and pathaneer halwa (sweet made from fresh unfermented toddy) are specialties of the region. The southern coastal region, including Kanyakumari, Madurai and Tirunelveli are well known for their seafood dishes. The cuisine has influences from neighboring Kerala and Sri Lanka. Among the popular dishes are Kari Dosai (dosa with mutton filling), Egg Parotta (minced parotta with egg) and Ulanthu Choru (rice with lentil). Curries and gravies use coconut – similar to Kerala cuisine. These include Fish Avial (dry side dish with fish and coconut), Theeyal (spicy gravy made with grated coconut) and Fish Kuzhambu (fish gravy with grated coconut and spices). Depending on the region visited, for travelers, Tamil Nadu’s cuisine can surprise the palate with its variety of flavors and textures. Rice is a staple, whether it is consumed steamed or as bread. Besides this, the interesting options of vegetarian and meat specialties present ample choice when it comes to deciding what to eat.